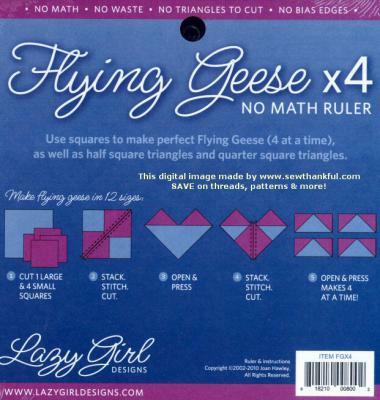 This fantastic flying geese ruler is wonderful for creating Flying Geese blocks without any math! That's right -- NO MATH!! The ruler makes 4 Flying Geese units from sizes 3/4" x 1 1/2" thru 3 1/2" x 7" with each repeat of this very easy technique. No triangles to cut or sew. All ruler marking are finished sizes. Block possibilities unlimited. Joan Hawley's Flying Geese & More book is recommended, sold separately. Click here to take a look at the book. I love this ruler! 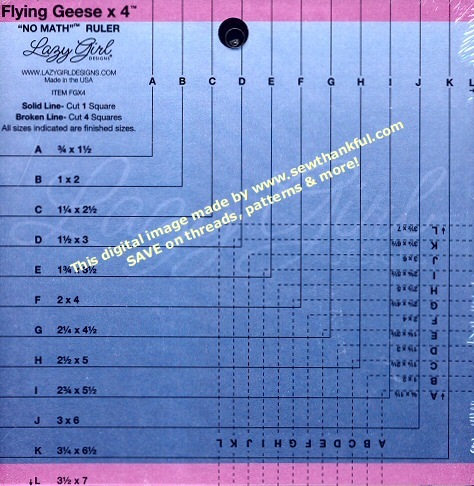 I could never make a proper flying geese until i found this ruler. It is very easy and simple to understand how to use it.